Genesis 1 gives us insight into the creative genius of God. Everything we see originated in the imagination of God. Out of the darkness, He spoke light. Now the earth was formless and empty, darkness was over the surface of the deep, and the Spirit of God was hovering over the waters. And God said, “Let there be light,” and there was light. God saw that the light was good, and he separated the light from the darkness, Genesis 1:2-4. God looked at creation and said, "It is good." God was pleased with His creation. As the Artist, He smiled on His workmanship. When we create, we are tapping into the mind of our Father. Every blank canvas is an opportunity to create something beautiful or capture the essence of something He's already created. Art is more than slathering paint on a canvas, writing a catchy melody, or even placing words together in a poem. 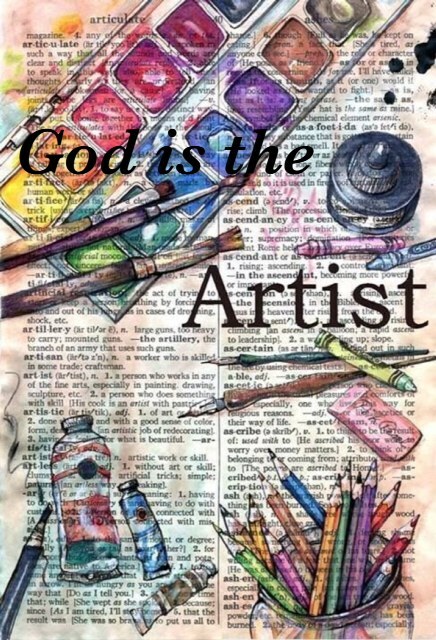 It is a creative expression which mirrors the creative mind of God. As an artist I have a high value for my artwork. Every poem, piece, song, or painting is valuable. They are all different, yet equally valued. I know the time and effort that went into each creation. God values all that He has created as well. Any art we produce has the capacity to echo God's wonderous works and bring glory to His name. Because ultimately He is the universe's most esteemed Artist.